A BLUE RIBBON school exemplifies excellence in teaching, student performance, school life, and school and community interaction. A BLUE RIBBON award winner is an excellent school involved in an on-going process of school improvement. 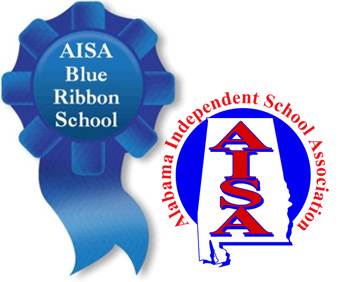 The Alabama Independent School Association awards a BLUE RIBBON to schools that meet and/or exceed the following criteria. Accredited by the Alabama Independent School Association (AISA). All professional staff meeting or exceeding the AISA professional criteria. SAT performance meets and/or exceeds the AISA Complete Battery average (60%) in grades 2, 4, 6, and 8; and/or AISA Complete Battery overall average is higher than the school's national ability overall average score. Excellent Physical Appearance of School (Buildings and Grounds). There are no existing priorities from the accreditation visit. No major accreditation or athletic sanctions have been placed on the school within the past twelve months. On-going process of school improvement. A School Improvement Plan is required. A School-wide Technology Plan must be developed and implemented. The Technology Plan must include a Mission Statement, Grade level Objectives, School Technology Inventory, Internet Use Policy, Professional Development Activities, Long Range Plans, and Evaluation of Implementation; Other minimum criteria for each school: Internet access to faculty and students; all students with Alabama Virtual Library cards; designated (not shared) school web-site; media center with Internet access; a Computer curriculum for all grades (K5 - 12), this may be included in the Technology Plan and an adequate number of computers for school student population.